Home » Website Building » WordPress » How to Submit WordPress Sitemap to Baidu? Submitting your Sitemap to Baidu search engine is an invitation based option in Baidu Webmaster Tools account. This means the Sitemap submission option will be enabled only if Baidu finds your site is qualified and sends you an invitation. It is difficult to get such invitations especially if your site is not in Chinese language. Baidu introduced a special plugin only for a self hosted WordPress site users to submit their Sitemap. Here we discuss how to download and use the plugin on your WordPress site. Baidu offers two plugins called “Baidu Submit” and “Discuz!” as a structured data analyzer tools. Basically both of these plugins are meant for a forum sites to submit dynamic content to Baidu but “Baidu Submit” is a dedicated WordPress plugin which can be used on any WordPress sites. Download the zip file of the WordPress plugin here and by extracting the zip file you will now have a folder called “baidusubmit”. Login to your WordPress admin dashboard and navigate to “Appearances > Plugins > Add New”. Click on the “Upload Plugin” button as shown in the below picture. Click on “Choose File” button and select the “baidusubmit” folder downloaded in the previous step. Click on “Install Now” button to install plugin on your WordPress site. You can also use FTP applications like FileZilla or “File Manager” option of your cPanel hosting account to upload the “baidusubmit” folder under “/wp-content/plugins/” directory. Once the plugin is successfully installed you can see it under “Installed Plugins” section and activate it. 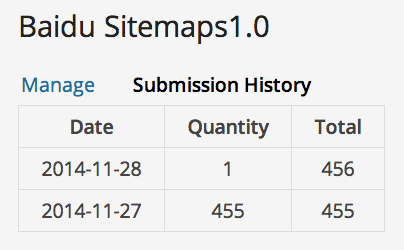 The plugin will add a new navigation menu “Baidu Sitemap” which will have two options – Manage and Submission History. In order to use the plugin you first need to verify your site. Click on the “Manage” option and you will the URL of WordPress base installation. Click on the “Verify” button as shown in the picture below. “Active submit” option is enabled by default which will send the new post data whenever you add content to your WordPress site. Click on “Submission History” option to see the number of posts currently submitted to Baidu. New content whenever created will be automatically submitted to Baidu instantly. The link you shared to download the “baidu submit” plugin is leading to error page. Please how can someone download this plugin, I don’t seem to find it in the WordPress repository? Thanks for the great post. You explained it so well. Going to install it just now. Thanks for this article. I installed this plugin and see the submission in WordPress admin panel. My question is will the status be visible in Baidu webmaster tools also? Only submission history in the plugin will show you the details, this will not be reflected in your webmaster tools account.